These new planilux models the reliable interpretation of mammograms. 4 freely moving shutters for glare free reading of any film format. 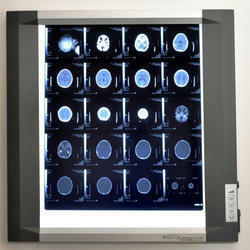 Planilux film viewers are highly suitable for viewing CT and MRI films. The EC, EH XU, XUH, XH range without shutters. Without shutters, viewing area with high- quality acrylic milk glass pane. 2 fluorescent lamps, not controllable. Fully electronic continuous brightness control, adjustment range of approx. 90%. 3 fluorescent lamps with switchover to 3 and 2 lamps, without continous brightness control. 3 fluorescent lamps switchable, not controllable. Flicker free energy - saving HF light. We are a leading name in manufacturing and exporting of X Ray Film View Box . 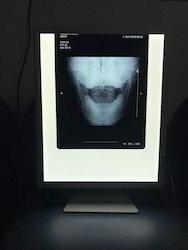 Bio-X specializes in the manufacture of X-ray film viewers (X-ray illuminator).Keeping the needs of the doctors in mind along with the continuously changing demands of hospitals and Nursing homes, we have developed a sleek and effective L.E.D. Viewing system to view M.R.I, C.T. and X Ray images. Bio-X offers a range of Single Screen , Double Screen, Three Screen, Four Screen viewers. Keeping the needs of the oncologist and radiologists in mind, Bio-X have developed a sleek and effective L.E.D. 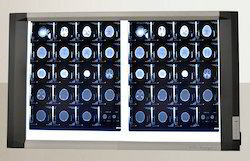 Viewing system to view Mammography film images which comes with an option of a sliding magnifying glass. 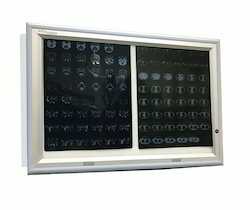 Biox is pleased to introduce X-Ray View box. This innovative x-ray illuminator finds a vast application in hospitals and nursing homes. 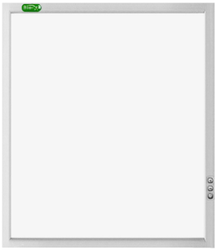 Ideal for viewing x-ray films and MRI, this offered illuminator is widely acclaimed in the market. Known for its long life span, it is immensely appreciated. Further, to suit the convenience of the customers, we make our range of x-ray viewer available at industry leading prices. 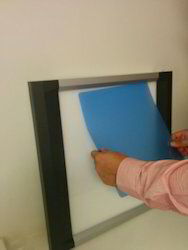 Bio-X specializes in the manufacture of X-Ray Film Viewer. Keeping the needs of the doctors in mind along with the continuously changing demands of hospitals and Nursing homes, we have developed a sleek and effective L.E.D. Viewing system to view M.R.I, C.T. and X Ray images. Bio-X offers a range of Single Screen, Double Screen, Three Screen and Four Screen viewers. We offer a combination of benefits that is unmatched by our competition: reliability, distinctive product line designed to match your requirements, technical support for layouts, excellent service and stunning looks. We are the manufacturer and supplier of X-Ray Viewer. This innovative x-ray illuminator finds a vast application in hospitals and nursing homes. 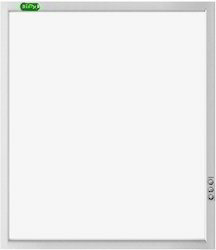 Ideal for viewing x-ray films and MRI, this offered illuminator is widely acclaimed in the market. Known for its long life span, it is immensely appreciated. Further, to suit the convenience of the customers, we make our range of x-ray viewer available at industry leading prices. LEDs are highly efficient. Various estimates of potential energy savings range from 82% to 93%. LEDs are projected to produce a long service life of about 100,000 hours. For this reason LEDs are ideal for hard-to-reach/maintain fixtures such as exit sign lighting and, combined with its durability, pathway lighting. This service life can be affected by the application and environmental factors, including heat and if being overdriven by the power supply. 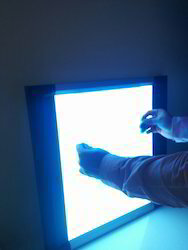 LEDs produce no UV radiation and little heat, making them ideal for X-ray film view boxes that definitely harmless for eyes. LEDs are highly rugged. They feature no filament that can be damaged due to shock and vibrations. They are subject to heat, however, and being overdriven by the power supply. With 12 steps digital dimmer can match different films for different person accurately. Built-in ROM can save the switch on brightness for friendly using. Bio-X is one of CE Marks and ISO certified X-ray view Box manufacturing company in India.We are supplier and trader of Biomedical equipment in India as well as Overseas .Our X Ray Viewers are known for its effective and accurate results, our products are as per international quality standard. 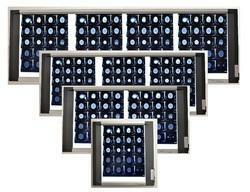 For the complete customer satisfaction, we are providing them desirable assortment of X Ray View Box. The offered X Ray View Box is manufactured by the efforts of competent persons and consuming optimum grade components including updated technology. Apart from this, the products offered by us is examined on diverse parameters and provided with customization facility which matches the requirements of customers. • Since our inception, we are engaged in manufacturing and supplying X Ray Film View Box. 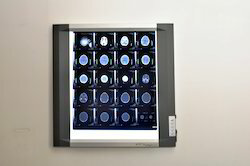 our Offered product is highly demanded in the medical and healthcare sector for the purpose of viewing reports of MRI scan, CT scan or X-Ray with better illumination and clarity. Further, our X Ray Film View Box is widely appreciated by the clients for its sleek design, light weight, low energy consumption and longer service life. 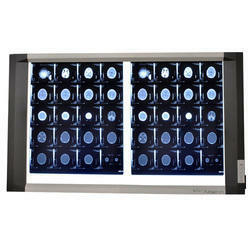 We are a leading name in manufacturing and exporting of LED X Ray View Box . 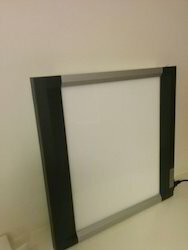 Bio-X specializes in the manufacture of X-ray film viewers (X-ray illuminator).Keeping the needs of the doctors in mind along with the continuously changing demands of hospitals and Nursing homes, we have developed an economical slim and effective L.E.D.Viewing system to view M.R.I, C.T. and X Ray images. The economical version of Bio-X slimLED X ray viewer is available in Single Screen and Double Screen.We offer a combination of benefits that is unmatched by our competition: reliability,distinctive product line designed to match your requirements, technical support forlayouts, excellent service and stunning looks.This extremely slim model has the power adaptor outside the view box. Bio-X specializes in the research and manufacture of L.E.D. 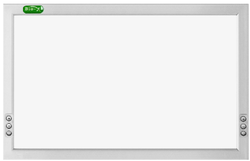 based X-ray film viewers (X-ray illuminator / X-ray viewbox). Keeping the needs of the doctors in mind along with the continuously changing demands of hospitals and Nursing homes, we have developed a sleek and effective L.E.D. Viewing system to view M.R.I, C.T. and X-Ray images. Bio-X offera a range of Single Screen, Double Screen ( Dual Screen ), Three Screen ( Triple Screen), Four Screen (Quadruple Screen) View boxes. Our range of ultra slim LED illuminators are being exported to Australia, South East Asia, Middle East, Africa, Turkey,Italy and Spain. 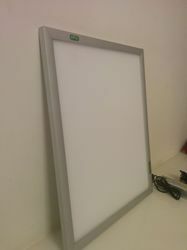 BIO-X is one othe leading manufacturer and supplier of LED X-RAY ILLUMINATOR,Because of its advance feature ,modern design and affordability,Bio-X LED X-RAY ILLUMINATOR have gain huge success in Indian as well as overseas Market in very short span of time.Now we are getting great response from Overseas Market. Long Life : LEDs are projected to produce a long service life of about 100,000 hours. For this reason LEDs are ideal for hard-to-reach / maintain fixtures such as exit sign lighting and, combined with its durability, pathway lighting. Life of the LED is about 4-5 times that of CFL/CCFL. 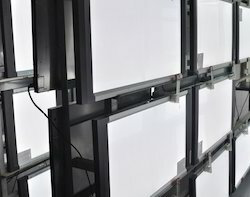 No UV Emissions / Little Infrared : LEDs produce no UV radiation and little heat, making them ideal for X-ray film view boxes that definitely harmless for eyes. Digital dimmer technology : with 12 steps digital dimmer to get the perfect brightness. Built-in ROM can save the switch on brightness for friendly use. 12 step digital dimmer to get the perfect brightness. 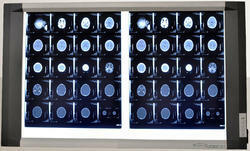 Use 9300k white and light-blue color temperature is ideally suitable for viewing X Ray, CT and MRI films. All our viewers are CE marked, i.e. they follow the European complaiance in terms of electrical safety. We offer a combination of benefits that is unmatched by our competition i.e. reliability, ease in operation, distinctive product line designed to match your requirements, technical support for layouts, excellent service and stunning looks. Keeping the needs of the oncologist and radiologists in mind, Bio-X have developed a sleek and effective L.E.D. 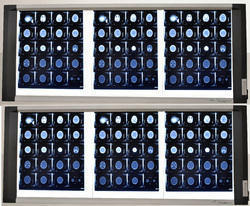 Veiwing system to view Mammography film images which comes with an option of a sliding magnifying glass. 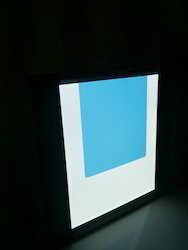 No UV Emissions / Little Infrared : LEDs produce no UV radiation and little heat, making them ideal for X-ray film view boxes that definetly harmless for eyes. Digital dimmer technolgy : with 12 steps digital dimmer to get the perfect brightness. Built-in ROM can save the switch on brightness for friendly use. All our viewers are CE marked, i.e. they follow the European compliance in terms of electrical safety. Kelvin Stainless aluminium film holders with an insertion depth of only 11 mm on all 4 sides of the viewing area. Size: 40 x 43 cm, 80 x 43 cm, 105 x 43 cm, 120 x 43 cm, 140 x 43 cm, 43 x 105 cm.